LONDON Marathon runners have been urged to reconsider taking part in fancy dress because Sunday’s race is set to be the warmest on record. Forecasts indicate sunshine and a temperature of 23 degrees Celsius (74 F), beating the previous high of 22.2 in 2007. Extra water, ice and showers will be available to runners. Throughout the 26.2-mile (42.2-kilometre) course there will be additional medical stations. Scottish runner Callum Hawkins suffered a scare during the recent Commonwealth Games Marathon on the Gold Coast, collapsing 2km from the finish line. A derogatory word used to refer to a Brit, derived from the acronym POME (Prisoner of Mother England). I guess some people do not understand, some people are not acclimatized to certain weather based where they live and grow up geographically. Australians, are acclimatized to hot weather, but not very cold weather. Not sure how this makes people soft. I am sure many Northern Europeans would take such a warning as scientifcally sound to take such advice. As they are not acclimatized to hot weather. EVERYONE knows Poms are soft when it comes to weather but this takes the cake as marathon runners were warned of a 23C “heatwave”. Veya keeps out of the sun, it melts snowflakes ! You really should be more careful just which online faux "dictionaries" you use to check out the supposed meaning of some of these slang terms, Dodgerii..
"Pommie" is actually a term of affection for our good Englische brethren down around this neck of the woods. nicko wrote: Veya keeps out of the sun, it melts snowflakes ! I am sort of with the OP here. English people are a bit wimpish whenever it gets slightly hot. I don’t consider anything under about 85F hot at all. I don’t even wear shorts unless it’s in the eighties. I’m a small build and pretty slim with hardly any body fat so I just don’t ever feel really hot! In Texas it got to over 100F a couple of times and I didn’t really complain much. Ben was waiting for me to drop dead of heat and it didn’t happen. Yes Texas is extremely hot, we had to go everywhere in air con car. I don't like the heat tbh. Yesterday and today was so hot, but a least its cool to sleep at night. eddie wrote: I am sort of with the OP here. English people are a bit wimpish whenever it gets slightly hot. I am able to be in the hottest weather and not likely to wimp out. Could you do physical work in such heat, when you are not used to it? I remeber my late dad telling me, when in the army, they were given salt tablets, in North Africa, when it was ridiculously hot. Just to ensure they did not dehydrate. It does not matter who you are, the heat will get to anyone Eddie. Some just are better adjusted to deal with such heat when running, but you never run half a mile in Texas, let alone a marathon. Well didge, I used to gig in the Maldives- singing and dancing on stage - for three hours a night in about 85F heat. eddie wrote: Well didge, I used to gig in the Maldives- singing and dancing on stage - for three hours a night in about 85F heat. Do you know how much energy it takes to sing live and dance and entertain for three hours and in platform boots??? eddie wrote: Do you know how much energy it takes to sing live and dance and entertain for three hours and in platform boots??? I’m always chilly. Ben’s air con drive me mad. The hottest days we have had here on the NSW east coast is around 45°C... And that is "in the shade", so that out in the open sun it can get over 50°, out on a tar/asphalt road or on concrete, it could go over 60° on occasions.. Inland from here, it will be 2 -->> 3°C higher, while over in central Oz and W.A. it can hit the mid-50s ("in the shade", again..). The highest temp that I have worked in would be up in the 50s -- need to keep your fluids up, plus electrolytes, and don't spend too long in the sun at a stretch. The lowest temp recorded on mainland Oz was --23°C ("officially" -- I also heard one report of --26..)down at Charlotte's Pass during the 1980s; the lowest that I've been out in here was out in a blizzard in the snow at Perisher, temp below minus 10 plus a wind-chill-factor of minus 10, that's effectively below --20°C.. So, the widest temp range that I have experienced around here is over 70°C over a year; (Southern California has a wider range -- from over 60° C in Death Valley to below 30 up in their mountains over winter (that's over 90 degrees Celsius !!! ); while some places in the Mid West USA, Canada, Russia and the Himalaya may go below minus-50°C regularly, they don't get quite as high in the summer..). Yep, those over-cautious Pommie athletics officials are indeed sounding like they're getting soft -- or maybe a bit shy of possible litigation if they don't remind people to stay hydrated when running in warm weather ? Whether you can handle very hot weather or very cold weather mainly has to do with your personal physiology and to how well you aclimatize over your lifetime also the kind of heat you experience. I don't like very hot weather and I don't like very cold weather, temperate climate, temperate person. Neither makes you a wimp and considering what can happen to you if your body gets badly overheated and dehydrated I suppose they have to warn people, the original mararthon runner was supposed to have delivered the message and dropped dead after all. I have experienced a few weeks of 86/88 in the Caribbean and it was very nice, not like when it gets to that temp here which tends to be like sitting in a steaming rain forest, although in summer it would apparently reach 100, wouldn't cope with that. As the humidity increases, conditions become more uncomfortable -- 90°C at 40% humidity is a lot more comfortable than at 80% or 90%, though as the humidity drops below 40% you will dehydrate faster, so should be drinking more frequently.. Staying out of too much direct sun (e.g. working in the shade, wearing a wide-brimmed hat and maybe a long-sleeved shirt..) also makes a big difference. A cool, moist breeze will make hot conditions more bearable, but cold conditions more miserable (and cold & wet conditions more deadly..); while conversely hot, dry winds will deydrate you faster and increase the risks of heatstroke. I might find a blog by a very hot-curry-eating Indian man, telling us all how pathetic most people become when they have a really hot curry....how most Ozzies he comes across just simply can’t handle it! Does the colour of your skin influence how much you feel the heat? I would have thought that the paler you are, the more you'll feel the heat. Anyway, the problem in this country is that nobody bothers with air conditioning because it's not hot for long enough. Old buildings can really retain the heat (and the cold). eddie wrote: I might find a blog by a very hot-curry-eating Indian man, telling us all how pathetic most people become when they have a really hot curry....how most Ozzies he comes across just simply can’t handle it! A lot of Aussies Can eat Very Hot food, between the Indians and South East Asians we are exposed to a lot, Plus Chilli plants grow easily across most of the country. We are advantaged by the fact that Genetically we are more suited towards the Frozen Wastes of Europe/UK where our ancestors came from but as individuals have personally acclimatized to hot weather. You know that an Ozzie can handle minus 10....how? See my earlier post, above..
Bergan Norway. lying in a slit trench Temp -30, Rifle tucked in sleeping bag with you. Bleeding freezing. Officers in wooden hut with stove ! So, 'Yank' and 'Yankee' are derogatory names?? Aren't you guys ashamed now that this has come to light. We don't want your apologies, but we will accept cash. Okay Veya and Wolfie....but can you handle the English RAIN, without moaning? eddie wrote: Okay Veya and Wolfie....but can you handle the English RAIN, without moaning? 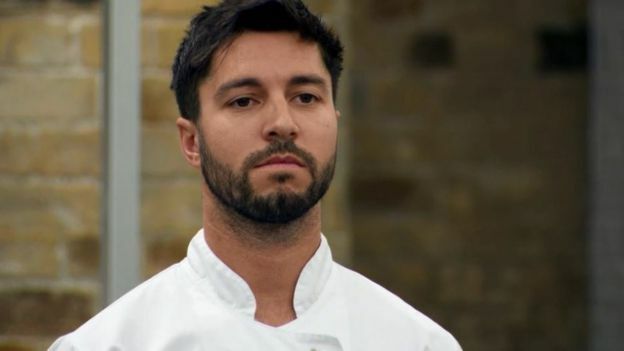 Matt Campbell, aged 29, a professional chef from the Lake District, has died after collapsing in Sunday’s London Marathon. The 29-year-old was running his first London marathon for the Brathay Trust, a charity that inspires vulnerable young people to make positive changes in their lives, yet was a keen and talented athlete who ran under three hours at the Manchester marathon earlier this month. The original term, 'Yankee Doodle', came from a gay bar located on the strand in London. British soldiers used to use it as a derisive term to refer to the American rebels. Americans picked it up and co-opted it as a joke, proving that Americans were more tolerant than the British. Original Quill wrote: The original term, 'Yankee Doodle', came from a gay bar located on the strand in London. British soldiers used to use it as a derisive term to refer to the American rebels. I did worry that the marathon was being run on the hottest day of the year. Sadly one guy died - Matt Campbell, TV reality show contestant who was running for charity. Nice guy. Could've been worse. I remember a northern marathon where 4 men died. Wiki wrote: It contained mostly nonsensical words in English and Dutch. In any case, by the time it got across the Atlantic, and into the real war, the Americans had co-opted the name and the song. It definitely had homosexual overtones, which the Americans turned on the British, who were then going through their late-18th century foppish phase. Logo wrote: The subtext—actually, it might just be the text—is that this quintessential American is a homosexual so daft that he can’t even demonstrate his homosexuality. The delicious irony is that, as the colonists began to win the war, they embraced “Yankee Doodle Dandy” as their own. After the Battle of Saratoga, an English officer reported hearing American troops singing the song in victory. The co-opting, as Americans now call it, was reapportioning slurs: "The point, says Segal, is not to stop singing “Yankee Doodle.” It’s to realize that reappropriating slurs is as American as apple pie." The term Doodle first appeared in English in the early seventeenth century and is thought to be derived from the Low German dudel, meaning "playing music badly", or Dödel, meaning "fool" or "simpleton". The Macaroni wig was an extreme fashion in the 1770s and became slang for being a fop. Dandies were men who placed particular importance upon physical appearance, refined language, and leisure hobbies. A self-made dandy was a British middle-class man who impersonated an aristocratic lifestyle. They notably wore silk strip cloth, stuck feathers in their hats, and carried two pocket watches with chains—"one to tell what time it was and the other to tell what time it was not". 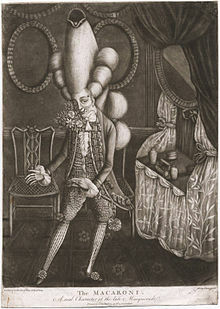 The macaroni wig was an example of such Rococo dandy fashion, popular in elite circles in Western Europe and much mocked in the London press. The term macaroni was used to describe a fashionable man who dressed and spoke in an outlandishly affected and effeminate manner. The term pejoratively referred to a man who "exceeded the ordinary bounds of fashion" in terms of clothes, fastidious eating, and gambling. In British conversation, the term "Yankee doodle dandy" implied unsophisticated misappropriation of high-class fashion, as though simply sticking a feather in one's cap would make one to be noble. Peter McNeil, professor of fashion studies, claims that the British were insinuating that the colonists were low-class men lacking masculinity, emphasizing that the American men were womanly. I've never said that "Tankee Doodle" came from the Strand. What I said was that the song (and hence the tag) of "Yankee Doodle" came from slurs about homosexuals. There was a gay bar on the Strand named Yankee Doodle, which was the origin of the song. You appear to be confused about the rhyming of "Tankee Doodle" and "Yankee Doodle". The former is a Dutch harvesting chant (according to your link). The latter is a song associated with the American Revolution. The term "Yank" is derived from the song "Yankee Doodle". The term "Tank" is a term for an armored military vehicle invented by the British. https://en.wikipedia.org/wiki/Tank It is not something particularly associated with Americans or the Revolutionary War. You are just a poor loser, didge. There is no disgrace in being the student. You're a mediocre researcher, but an absolutely zilch thinker. That the song 'Yankee Doodle' came from the British soldiers is unquestioned. That it was infected with gay overtones is in all the research; the name 'Yankee Doodle' came from a London gay pub by the same name. That it became the source of the name for Americans,Yankees, is acknowledged by all researchers and common knowledge. That the Americans co-opted it and turned it on the Brits, is also well established. You lost the last debate (about the origin of pommies), and now you're trying to make up ground with this nonsense about 'Yankee Doodle' being a Dutch chant. You just dig your holes deeper and deeper, so as not to acknowledge that you are wrong. Like I say, you are at best a clown, on your knowledge of history. Give it up, didge. You've already lost. Original Quill wrote: Give it up, didge. You've already lost. How about you learn some humility for once, when wrong. I've never been wrong with you, didge. Just persistent. Now go to sleep...you'll forget you lost in the morning. That is a major issue you have there Quill.